I am an avid player of Gardens of time on Facebook. In order to acquire neighbors to top the game, I randomly added rank strangers, equally fond of the game, from all corners of the world. During the course of playing, many neighbors caught my interest by their riveting status messages and snaps. One of them was C.P. (I am using the initials as I don't want to disclose the name.) who used to amuse his friends regularly through his poems and anecdotes on his dates fixed by his family. For couple of weeks, however, I didn't spot any status update posted by him. Today someone calling himself 'Rahul' posted a status update from C.P's account informing his friends that C.P has died in a fatal car accident one and half month ago and that he shared his password with Rahul allowing him to play Gardens of time on C.P. 's behalf. It was true shocking to believe because if the news is true, it's heart-rending. C.P is a young fellow in his early thirties, full of life. It is so hard to believe that he is dead. But the follow-up messages from his friends, one of whom claimed that she talked to his mother to confirm the news said it's true. Incidents like this forces one to believe in the uncertainty of life. One moment we are alive and the next we are just turned into memories. 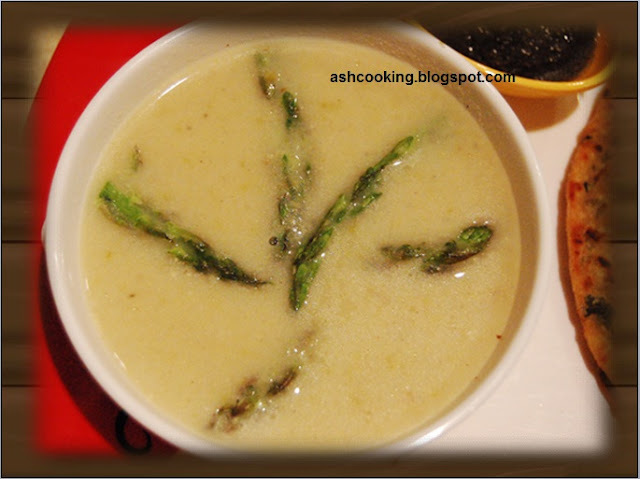 1) In a microwave safe bowl place asparagus and onion in 2 cups of water and boil them for 10 minutes. If you are cooking on gas oven or stove top, in a saucepan similarly toss together the above mentioned two ingredients and bring them to a boil. Simmer away till asparagus and onions soften. 2) Drain the water and grind asparagus and onion into a smooth paste, using a blender. 4) Then add the asparagus paste followed by chicken stock, sweet corns and yogurt. Sprinkle salt, black pepper powder and nutmeg powder. Bring the soup to a boil. If you want thin soup, add water as per need. Mine was moderate in consistency, neither too thick nor too thin. I added water accordingly. 5) When soup comes to the right consistency of your liking, squeeze lemon juice and fold in whipping cream. Hi Shabali, it is so nice to know that someone is an avid reader of my blog. The number of followers of my blog compared to others really gives me inferiority complex and then getting to know that someone really is fond of my blog makes me feel encouraged to go on. I like the dreams of yours to open a dhaba in the hills and pray that it comes true sooner or later. Loved the fact that you are also fond of gardens of time. With some 60 + neighbours, right now I am at 74 level. It's so sad that they have removed the option of earning gold these days. Sigh !! Hi Thanks a lot. I almost check everyday. 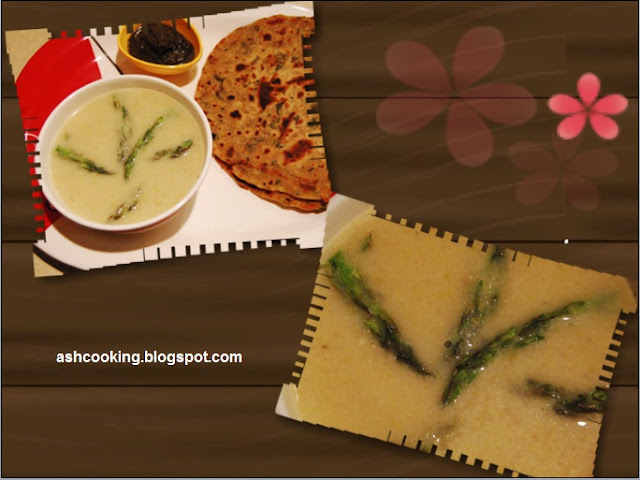 I have tried some of ur recipes. One thing which I have never been very good is baking and when I see u all doing such wonderful things, I feel I m missing something. Another dream in the pipeline is to join some baking class, (delhi does not hav many). In Gardens of time, I m at level 47, with 32. One reason I like it because I m crazy abt hidden object games. Ll keep reading ur blog, so keep writing. Jhum Jhum, baking is easy if you know few tricks. Rest depends on practice.